Shelley Bean: Punky Teens Christmas Release Blog Hop! Welcome! 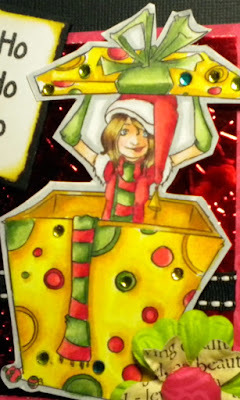 You have likely hopped here from Samantha's Blog in the Punky Teens Christmas Release Blog Hop! If you would like to start from the very beginning you can hop to the front and visit Simply Betty's Challenge Blog to find out about the really cool challenge you can enter! Be sure to check that out and participate!! I was thrilled to be included in the new release of Simply Betty's Punky Teens Christmas release! Here is my take on the "Trixie" digi she just released. These designs are so quirky and cute...I really love them! I know you will too! Now that you have looked over my contribution to this fabulous hop....it's time to pop next door and see what's happening over at Suzi's blog for the next stop along your way. Oh...and please come back and visit often. I would be so flattered if you left me a comment or became a follower. There are always new things developing over here and I would love to share them with you!! Shelley, you always do such amazing work, love your project. These stamps are so cool. Great card! Love the bright colors you colored with! Great work! 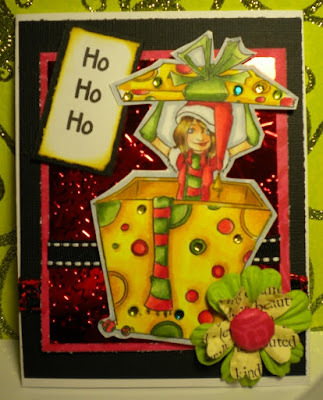 I love the rhinestones on the present, and that foil paper you used! This was worth the wait! Amazing Shelley! Can't wait to HOP with you tomorrow. I hope Blogger posts for you! Beautiful coloring, Shelley! Love the colors and all of the rhinestones... fabulous! Just beautiful. Great color choices, your image stands out. Very pretty! This is soooo stinking cute!!!! Love it! I love the gems - the textures you've added roc!! Good job! Great project! Love, love it! Very talented work! WOW! 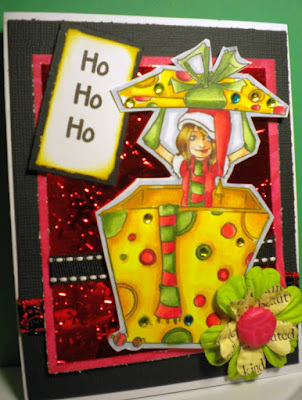 Hop on over to my site….there is a blog hop going on right now with LOTS of blog candy to be won! Oh wow! Your coloring is divine and I love the embossed foil background! So very glad you could join us today on the hop! Great work, you are so creative. Love the colors together! Love the bling on your package. I love the intense colors you've used and the bling on the box. Fantastic job! Thanks for hopping along with SBC!